A 61 year old man from Hin Lek Fai sub-district of Hua Hin died Thursday one day after being admitted to Hua Hin hospital believed to be suffering from rabies. He was bitten two months ago on the hand by a neighbor's cat that had not been vaccinated. The cat died within three days of subsequently being spayed. Dr Surin Seubseung of the Prajuab Khirikhan department of public health said that tests would be carried out on the dead man's sputum, spinal fluid, urine and hair follicles to confirm he died from the deadly disease. 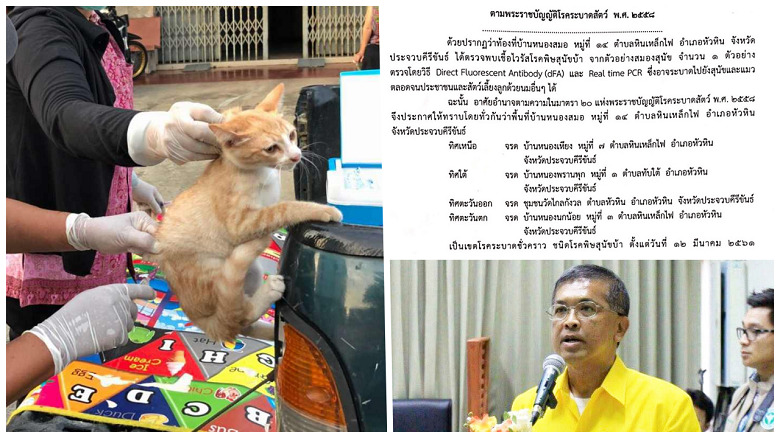 Dr Surin said that symptoms show in victims before six months have elapsed from a bite or licked scratch. Death is almost certain for anyone who shows symptoms of rabies. Health officials are investigating the immediate area where the victim lived and giving vaccinations. A five mile radius around his home has been declared a rabies zone. What sadness for this man who had to suffer. while schools have put down banners forbidding food. 5 miles - that's a large radius, I wonder if this covers all of Hua Hin ? A handy map with a large red circle on it would be nice, I'm not sure if they released the guys address. Hin Lek Fai stretches about 5 miles inland by the looks of it. Spaying/neutering an animal, be it a cat or dog, does not prevent the animal from having rabies. The man should have had the rabies shots. It only takes one a month for three months and is a painless way to stop getting such a debilitating disease. In most western countries an animal suspected of having rabies is usually sent to a veterinary university where it is euthanised and a post-mortem is conducted. If no university is nearby, then the task of killing the animal is given to a vet and then the head is removed and sent away for diagnosis. See it done a few times in England and Canada. No need for a zone of any size to be enforced. Contradictory to what Dr. Surin says, it usually takes 2-8 weeks for any symptoms to show in a person who has been bitten or scratched by an infected animal although there are always exceptions. Children are different and can have much earlier signs. Anybody feeding the soi dogs, etc., could be asking for trouble. Hopefully they could add it as a new reason to cancel a visa ! Another person dies an still ther will be those who just do not want to see the stray animals culled. What a stupid country that thinks that this problem will go away if the animals get shots, etc. So, one more died agonizingly in a situation under control. R.I.P. I'm not qualified to diagnose either. I leave that to self certifed specialists. One rumour was that there was a worry about foxes bringing in rabies from France through the tunnel. Never proved to be the case and the same with the bat story I believe. Just the wind up merchants at work I suspect. My concern in Thailand would be whether they are savvy enough to deal with an epidemic IF it should occur. The authorities tend to sweep these things under the carpet rather than deal with it. What is going on here? Not long ago I had was assured by some here on TV that there is no problem with rabies in Thailand. I was denounced and ridiculed-hmmmm I hope you guys are ok? This seems to be an endless argument like gun control or defending Trump. What just about EVERYBODY fails to realize is you will hardly ever change minds on this forum. It's more like a tag-team wrestling match, folks sitting on the sidelines, frothing like rabid weasels, just WAITING to jump in and insult someone. Insults, anybody?